If you are wondering what is polenta made from and how is it used, then the answer is very simple. Polenta is made from ground corn and can be used in a wide variety of ways. Polenta is a versatile type of food. It is perfect for both vegetarians and vegans because it is made from just cornmeal and water. Polenta is part of the staple diet of Italy. While it was originally most common in the north of Italy, today it is a popular dish which is enjoyed throughout Italy and in many other parts of the world. Polenta was traditionally thought of as a peasant dish. It is cheap and easy to prepare, yet it is filling and wholesome. This made it a useful dish for people who were working on the land who required food that was high in energy. Polenta is prepared in many ways. It is generally cooked with water at a ratio of three parts water to one part ground cornmeal. The mix is then heated and stirred for a period of about an hour until it is formed into a thick paste. This can be served as soft polenta which is perfect for a side dish or poured into a flat dish and left to cool. This will then stiffen and become like a cake. This can then be sliced and fried to make a crispy alternative. Traditionally, families would have their own way of preparing polenta. Today, many more convenient ways of preparing polenta have been developed. It is also possible to buy instant polenta. While this is convenient, it may not be the best introduction to this rich and versatile dish. What is Polenta Served With? When many people wonder what is polenta served with, they often are thinking about whether it is a sweet or savory dish. The answer is both! Polenta is bland tasting and can be used as an accompaniment to highly seasoned savory dishes or with jams or other conserves as a sweet dish. 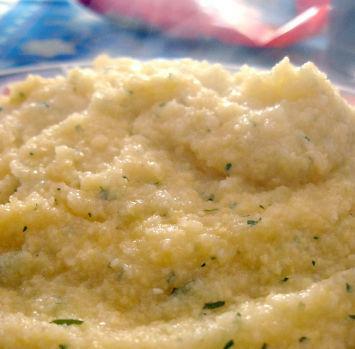 This high versatility is one of the reasons why polenta remains popular. Vegetarians and vegans can enjoy polenta with a wide variety of dishes. It is a great accompaniment to many healthy vegetable casseroles and stews. It can help turn a light dish into a more substantial meal. Vegetarians who eat dairy products can add milk or butter to the polenta to make it more rich, or add some honey for sweetness. Vegans can add yeast flakes for extra flavor or nuts and seeds which give texture as well as flavor. A simple topping for hot soft polenta is tomato sauce or tomato sauce mixed with fresh vegetables such as mushroom and zucchini. Yellow cornmeal is usually used to make polenta. This can be purchased from health food stores and supermarkets. It is sold in bags in a variety of sizes. Ground cornmeal has a long shelf life and will keep at home, which means that buying large sized bags can be an economical option. When the cornmeal is open it is best to keep it in an air tight container. When asked 'what is polenta' the answer is quite simple. Polenta is a versatile dish that can be enjoyed by vegetarians and vegans alike. Its versatility makes it an exciting dish to learn more about.